After traveling for the better part of a year and a half, we were incredibly tired, the kind of tired where you don’t want to get dressed all day and just want to eat ramen and cold pizza. We didn’t want to have to think about where to go for dinner, what restaurant would have food which was not too spicy for the kids to eat, worry about them getting run over by motos and taxis every time we left our hotel/apartment/room, etc. We just wanted to relax for a while and catch our collective breath. The first place we thought of was Thailand. Colburn and I had gone to Thailand as we ended our last Asia trip in October of 2001. We really enjoyed the ease of travel, the amazing food, and the very kind people we met during that trip. It is also a great place to “splurge” without breaking the bank as the dollar goes pretty far here. 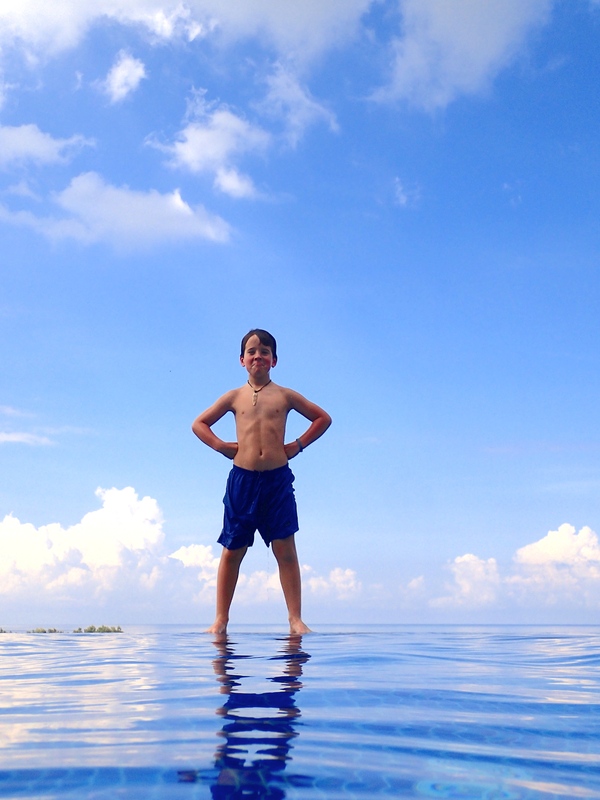 We decided that Thailand would be where we would take a vacation from our travel. A quick internet search landed us with a phenomenal rental villa on a relatively quiet island, Ko Lanta. Unlike its much busier neighbors, Phuket and Ko Phi Phi, Ko Lanta was not wiped out by the 2004 tsunami and has retained its laid back beach vibe despite significant growth in the past few years. To be certain, there are full moon parties, new moon parties, half moon parties and just about every other kind of party, but they are all very low-key in comparison to Phuket and Phi Phi. The population of Lanta is largely Muslim, not Western, so tourism has not steam-rolled the local population as it has elsewhere. It is also somewhat difficult to get to (2.5 hours from the nearest airport including two car ferries). We found a great villa that was a huge splurge for us, but one that we thought we could afford given all the budget-conscious accommodation we had in Nepal and throughout Europe. Our welcoming towel sculpture. There was a new one most every day. Arriving in the early evening just as the sun was setting, we were giddy with excitement as the villa was even better than we had anticipated. Located up on a hill with endless views across the Andaman Sea, but only 5 minutes to the main beach area. It is spotless, modern and built with exceptional craftsmanship. 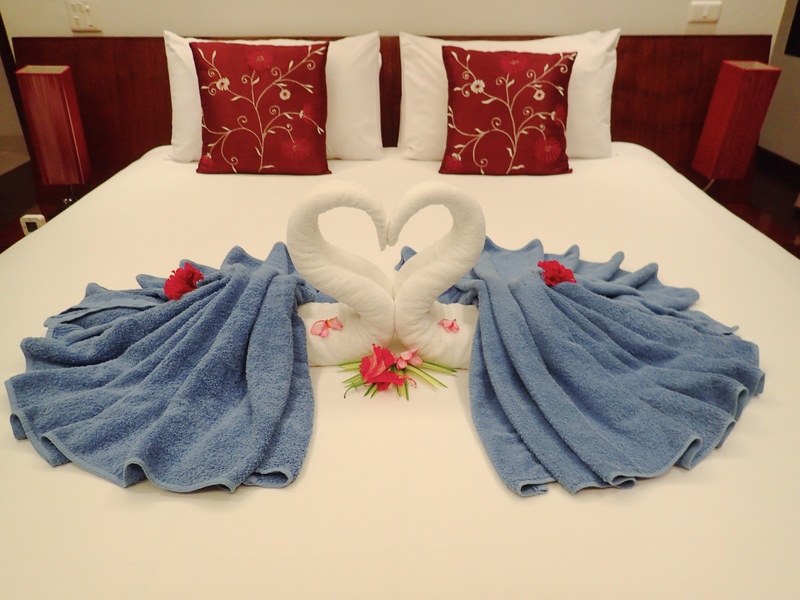 Fresh flowers, beautiful towel sculptures, and even a cold beer awaited our arrival. We felt as if we had traveled to a different planet. Definitely not a resort, but with all the conveniences of having a full staff, everything is handled for you by the owners, Luk and Ian, and their staff. If you’d like dinner brought to the villa, just let them know what you want and they will get it take out from their favorite local restaurants then serve it plated in your villa. Need dinner reservations or a driver for the day, no worries. Everything was just perfect for us to relax. We were enjoying having a beautiful, climate controlled, modern home so much that we didn’t even leave the house for the first couple days. We had food brought in, caught up on sleep, played in the pool, did some school and watched videos. We planned the second half of our year and made reservations. Around day three we began to get a little itchy to do something other than sit around so decided to check out the diving scene. 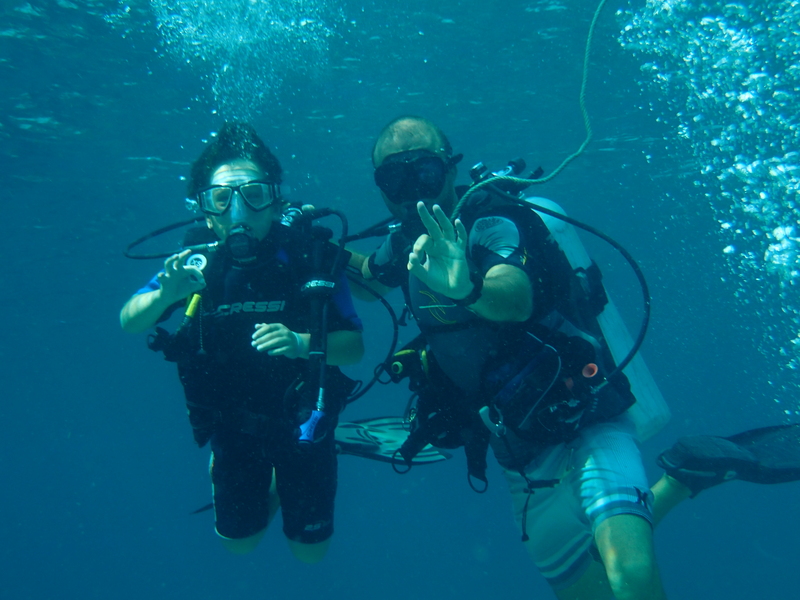 We aren’t really scuba divers, but Colburn and I did do an open water course13 years ago which we loved. We just haven’t had the opportunity to do a lot of diving. Our villa manager called their favorite dive shop and the manager tracked us down at dinner that night. Lee was personable, relaxed, and seems like a really competent yet unpretentious guy. 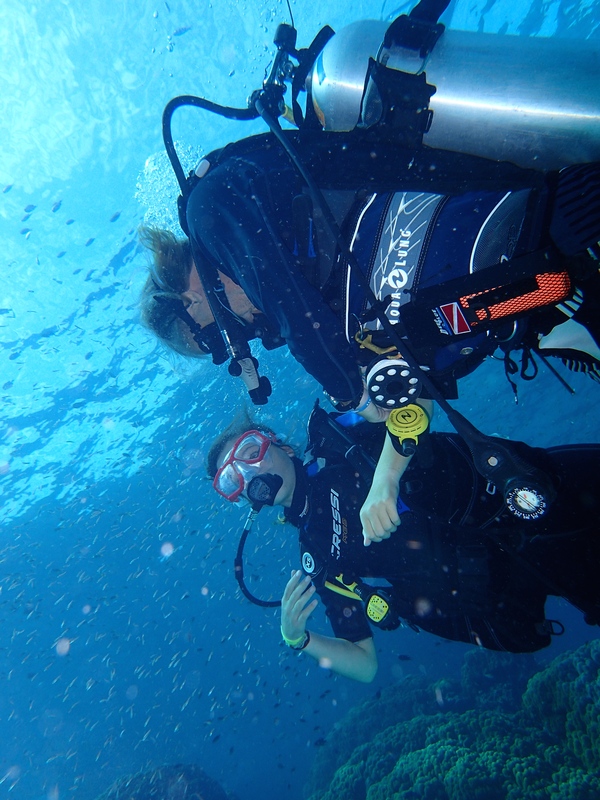 He explained that it would only take a quick refresher to get the adults back up to speed and the kids could do kid-specific intro courses simultaneously – “bubble maker” for Mac (depth limit 2 meters) and “discover scuba” for Lucia (depth limit 12 meters). 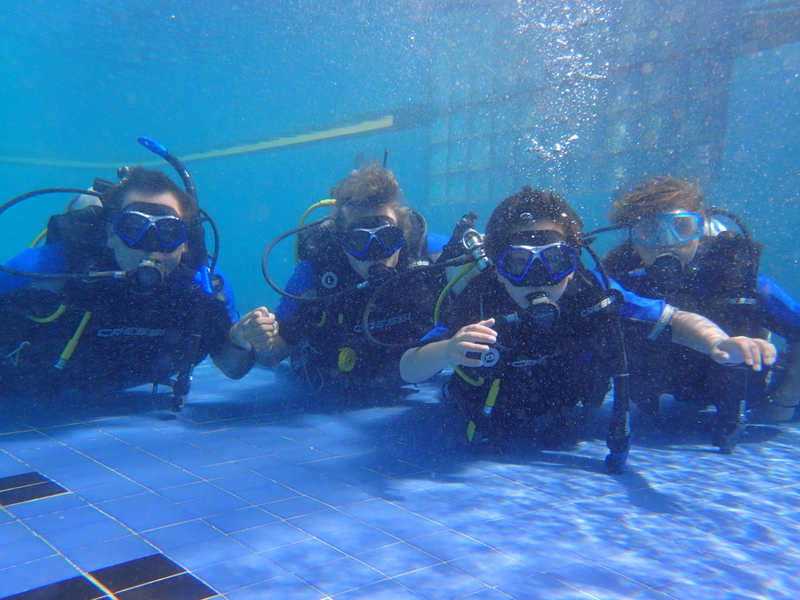 Everyone was excited to try diving, so we signed up. A bit nervous, we showed up at the dive shop the next day for our pool session. When your 11 year old is going to be breathing under 12 meters of water for the first time, you want to make sure that you have confidence in who will be monitoring her safety. Within minutes of meeting our phenomenal dive instructors, Steve and Harun, we all felt relaxed and comfortable about what we were going to do. Both men are casual yet very professional, genuinely caring, and excellent teachers. 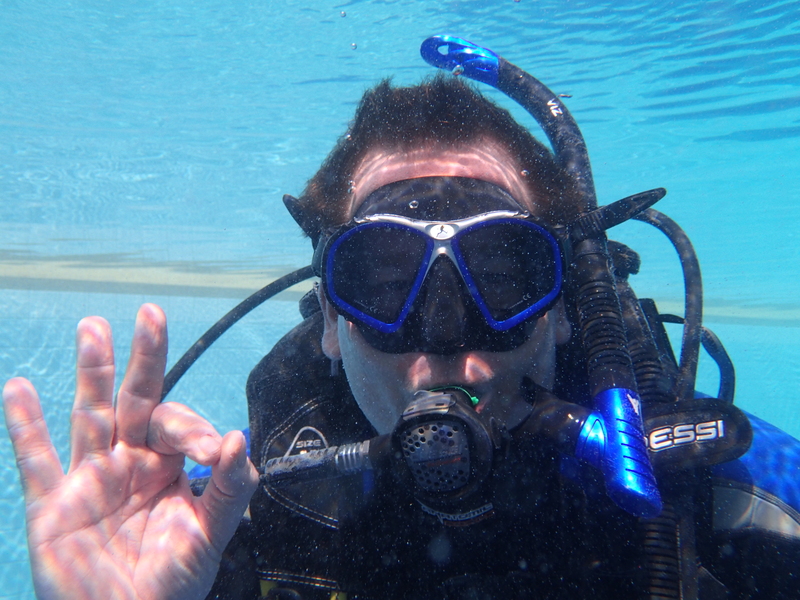 A quick review of essentials and some time practicing underwater skills like equalizing your ear pressure, clearing your mask of water and retrieving your regulator should it fall out were accomplished quickly. Harun said that he knew the kids would be fine when he told them to watch his demonstration of regulator retrieval but instead of watching they copied him step for step as he was showing the skill. As the lesson came to a close, he showed us how to blow bubble rings underwater, quickly creating a new obsession for us all. The next day we headed out one of the local dive sites, Ko Haa, a collection of six small uninhabited islands about an hour and a half south west of our town. 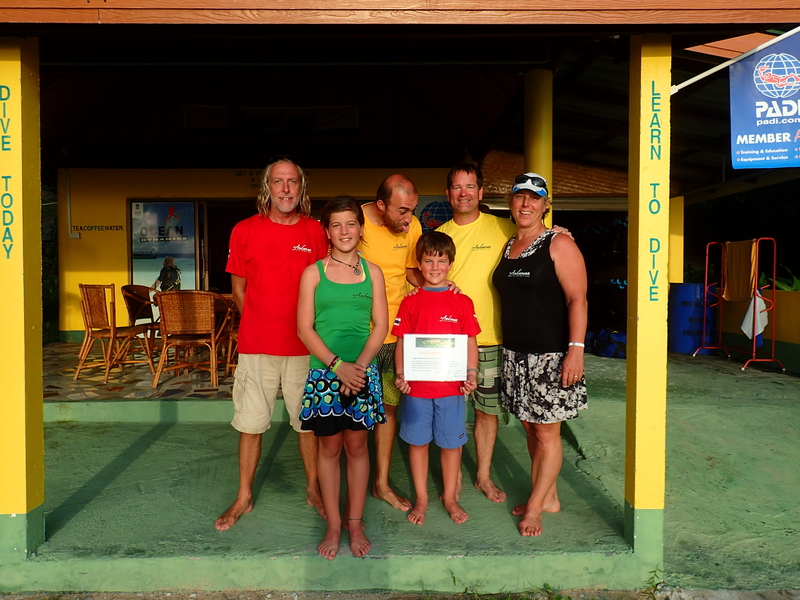 Harun would be Mac’s buddy at two meters and Steve would dive with Lucia, Colburn and me a bit lower. Our first dive together was wonderful. Working our way along the edge of two of the islands along a relatively shallow ledge (15 meters) allowed us all to get used to the process while seeing heaps of reef fishes – three different kinds of puffers, the improbable box fish, scorpionfish, some barracuda, several moray eels (one of which was HUGE), and lots of others. Both kids came up ecstatic, as were we. On the boat with us were Tony and Chris, a wonderful couple from the Netherlands, who were as happy for the children’s success as we were. The second dive was equally as exciting with Mac spotting two sea snakes, a crown of thorns sea star, and a very large grouper. He has an eye for wildlife spotting and his talent showed itself underwater as well. Tired, a little sun-burned, and incredibly happy we motored back to town completely at ease. We had so much fun, we decided to do it again a couple days later with the same crew of people! 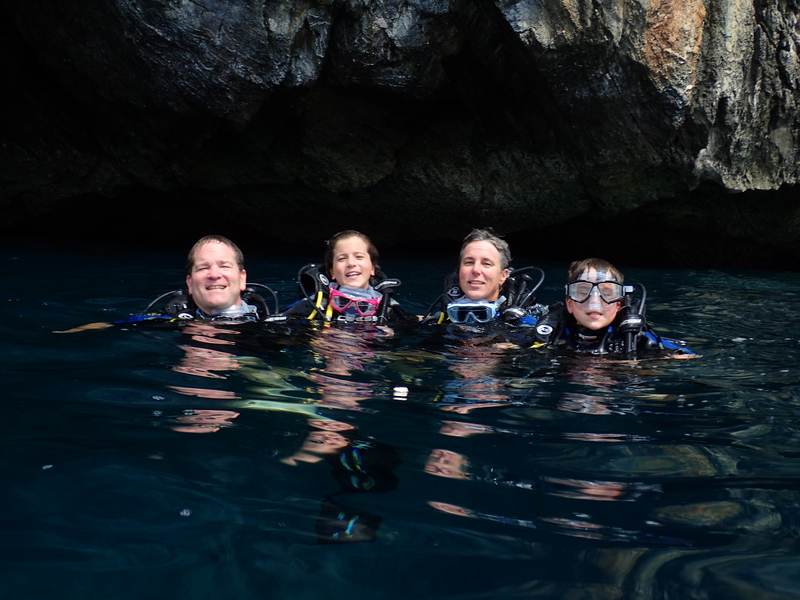 Beyond the joy of sharing a new experience with your kids, watching them explore the underwater world was wonderful. Lucia said that, while she enjoys watching the wildlife, her favorite parts were feeling like she was flying through the water and playing with the bubbles as she moved along. Like Mac, she has an eye for wildlife spotting, but seems to enjoy the whole process so even if there are not a lot of animals, she still thinks it is awesome. Mac is now adding dive master to his list of possible career options and we can only guess what his perspective will be when he can go deeper than six feet. 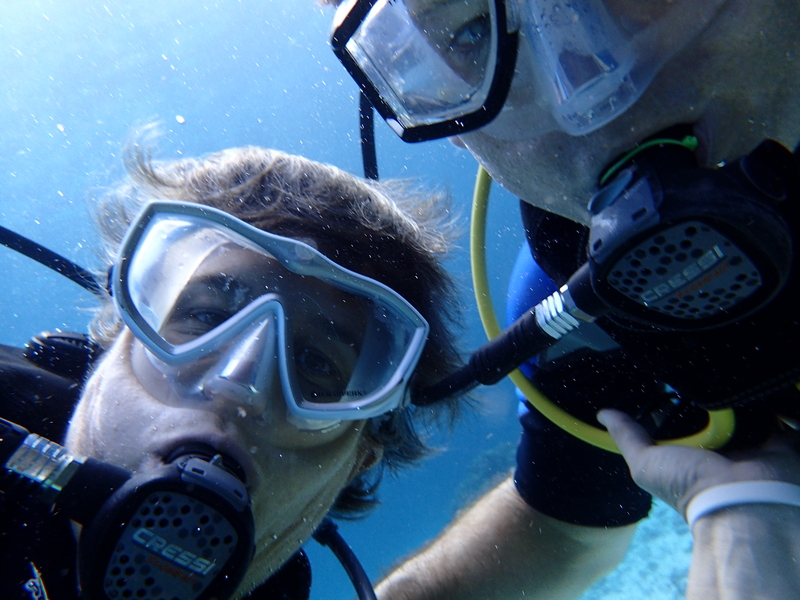 Colburn and I have always wanted to do more diving, but with young kids, it was not a priority. Now that we can enjoy it as a family, it will definitely be on our radar. Our group! Harun knew when to focus and when to be silly! As we came back to our lovely villa at the end of our second day of diving, we were elated by the combination of rest, activity, and having spent time with some incredible people. This might be the most perfect week ever. You’re right — that sounds pretty perfect!